I have been a compulsive reader my whole life. At a young age I found my reading niche in the fantastic genre of Speculative Fiction. I blame my active imagination for the hobbies that threaten to consume my life. I am a freelance writer and editor, a semi-pro nature photographer, world traveler, two-time cancer survivor, and mom to one rambunctious toddler. In my ideal world, I’d do nothing but drink lots of tea and read from a never ending pile of speculative fiction books. Other than this website, you can find me on SF Signal for my weekly column Special Needs in Strange Worlds where I try my hardest to get a conversation going (and keep it going) about the importance of disabilities in this genre I love so much. Occasionally you can find me on the podcasts of those brave enough to ask me to participate, doing interviews or writing guest posts around the internet, and hopefully soon I’ll be participating in some conventions. You can find me annoying people on Twitter as @BookwormBlues, on Facebook, and here, on Bookworm Blues. Her five favorite novels from 2014 . . . so far. 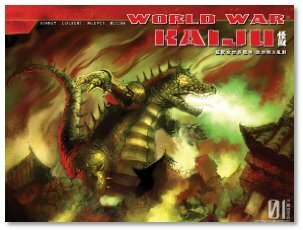 We have two copies of World War Kaiju from 01publishing to give to listeners in the United States (due to shipping restrictions). To enter, SHARE this post on Facebook or tweet about us on Twitter. Say something about the book giveaway, or encourage your friends to subscribe. Just make sure you tag us so we see your entry. Entries due October 31, 2014.